For over a decade, the World Wildlife Fund (WWF) has been working with communities in West Kameng and Tawang districts of Arunachal Pradesh to preserve forest resources and make them self-reliant. While considerable amount of success has been achieved, without proper policies in place, successes will mean little in the long-run. WWF-India began its work in Thembang in West Kameng in 2004 with the introduction of Community Conserved Areas (CCA) which comprises of a village-level management committee that is given the responsibility to conserve natural resources and address local livelihood means. Among its goals is to engage villagers in collective dialogue and decision-making relating to conserving natural resources found in the forests of the area including wildlife. After their initial success, the WWF replicated its model in Zemithang in neighbouring Tawang district in 2007. Zemithang has an important role to play in conservation as it is one of the two remaining wintering sites of the black-necked crane in the state- the other being Sangti Valley. Earlier, the birds were reported to have been sighted at Ziro Valley in Lower Subansiri district too but have since stopped coming after a few of them died when they got entangled in electrical wires. 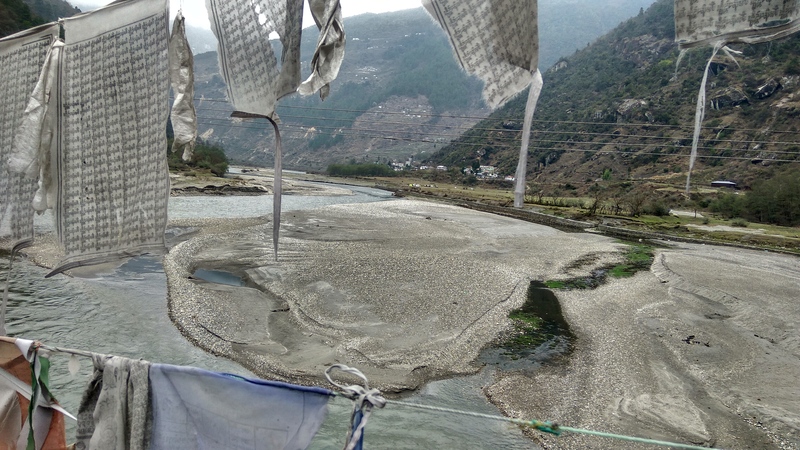 The riverbed of Nyamjang Chhu that is the wintering site of the black-necked crane. Kamal Medhi, the Western Arunachal Landscape co-ordinator for the WWF who has been working in the region for years, informed that there were 21 sightings of the birds from last November to March this year- a significant improvement from the past. The WWF’s work has also led to increased awareness amongst the people, Medhi said, and that people these days inform the WWF officials whenever they see the birds which come to the dry riverbed of the Nyamjang Chhu. The birds are of special importance to the Buddhist Monpa tribe who consider the black-necked crane sacred. And while game hunting in the area has never been a major issue, Medhi informed that the musk deer, called laa-va locally, is hunted for its bile which is used extensively in Chinese traditional medicine. Reportedly, the animal is hunted and its bile extracted before making its way to China through Nepal. Medhi said that the hunting of the deer is not an issue amongst the seven villages in the Zemithang area that are part of the WWF’s CCA but that there is a threat from villages outside of the area. “Villages in Zemithang have served notices to the other offending villages to curb the problem,” he said. There are also economic benefits that villagers are slowly beginning to witness from conserving forest resources. Recently, the Pangchen CCA Management Committee (comprising of Lakhar, Lumpo and Muchat villages) began manufacturing incense sticks that are used extensively by most Buddhist tribes of the state. It’s an initiative that could become an alternative to a widely used product that is currently brought in from the North Bengal area. The WWF currently has 1,200 square km of land under the CCA model including villages in Thembang, Zemithang and Manlaphu (which was inducted last year). But that figure is relatively small compared to the work that needs to be done. “We are saving a small portion of forests through the CCA model,” Medhi informed and that around 30,000 square km of land is still officially designated as Unclassed State Forests. “The government should come up with policies to give the management of forests to the local communities, whether in the form of CCAs or any other model,” he said. Aside from the lack of a clear policy on the tribal people’s rights and use of forest resources, at the policy level the issue gets more complicated due to the region’s proximity to the sensitive international border it shares with China. Foreigners are not permitted to enter Zemithang, even with special permits, which can affect the tourism of the area. Although homestays have sprung up, the place has been unable to attract foreign tourists due to travel restrictions. Recently, a group of environment enthusiasts from Bhutan who had wanted to visit the area for the black-necked crane were given a hard time due to the existing laws. Ironic, considering that traders and pilgrims who belong to the same Monpa community but live across the border in Bhutan regularly venture into the region with ease, as theIndian armed forces personnel are not aware of the subtle differences in the traditional attires of the cousin communities.